The word MATH has a vertical line of symmetry. The parts of the letters on the left of the vertical line are reflected on the right. On the other hand, the word DECK has a horizontal line of symmetry. The parts of the letters below horizontal line are reflected above. 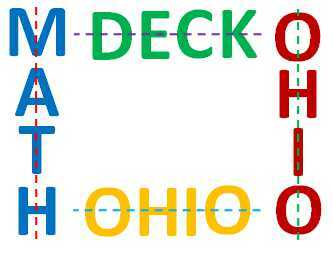 The word OHIO is both horizontally and vertically symmetric. Challenge: Find as many words as you can that are horizontally symmetric, vertically symmetric, and both. What are the longest symmetric words of each kind? Symmetry is considered by many as a reflection of beauty and perfection. A symmetric object is an object where we can place a line such that the images on both sides of the line mirror each other.